Dolphin Restaurant on the Hudson River waterfront is a restaurant I have been eager to try for some time. 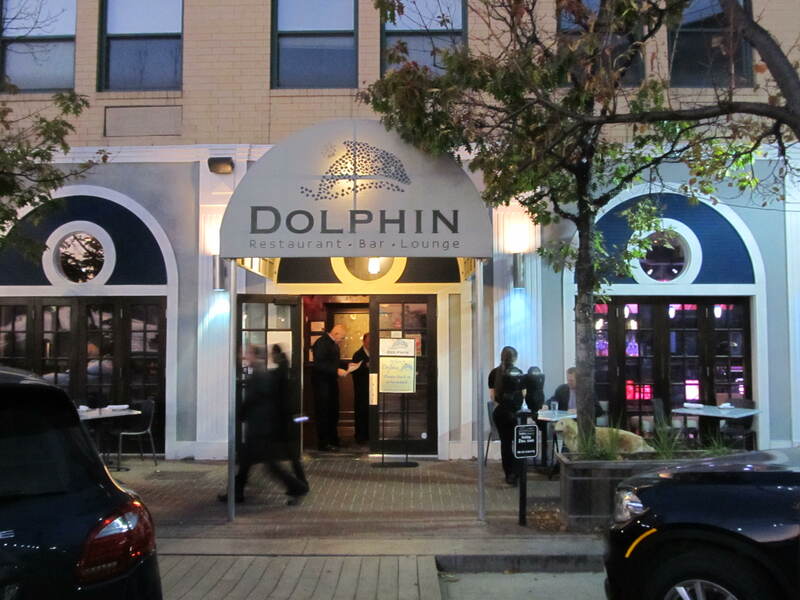 There is a cool hip vibe as you first arrive at the beautiful river front location of Dolphin in Yonkers. The parking valet is right out front and is waiting so there is no need to concern yourself with trying to find a parking spot. 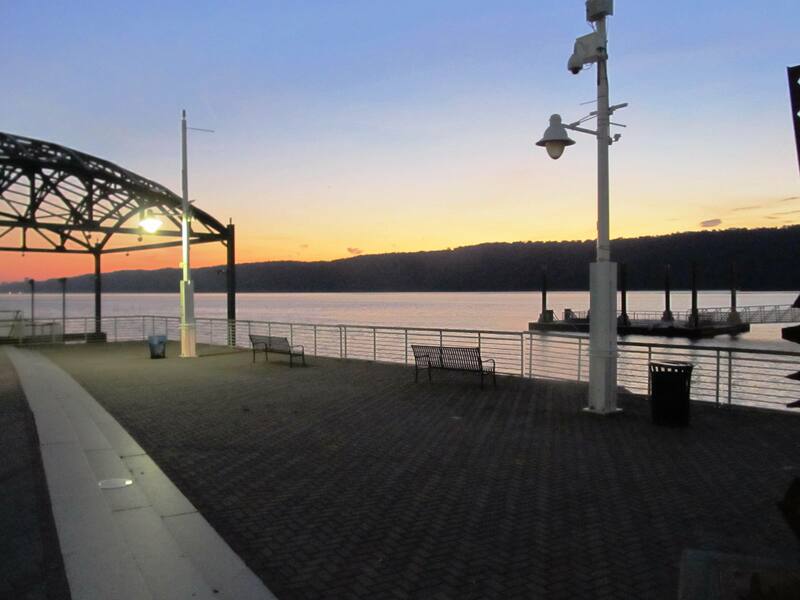 If you are lucky enough to arrive at Dolphin in the daylight you will notice its spectacular spot, situated on the banks of the Hudson River with a view of the Palisades cliffs across the river. 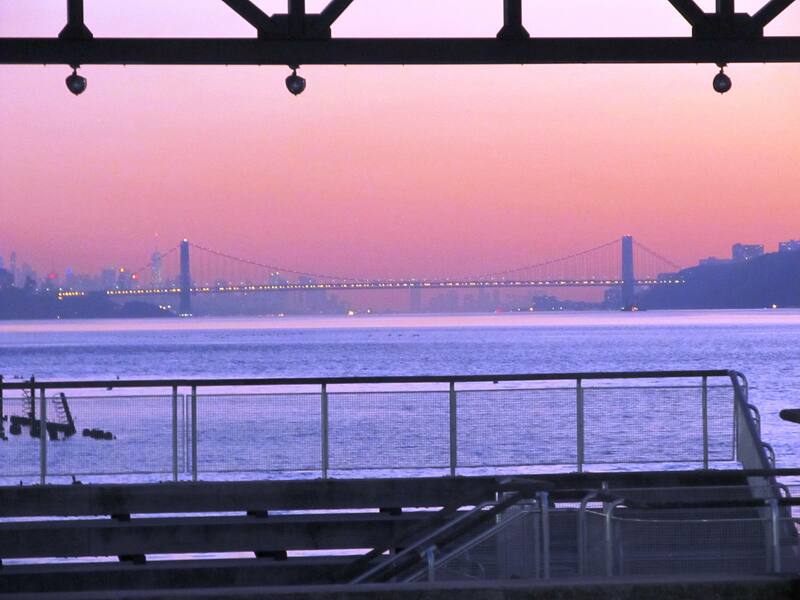 Looking down river you can see the George Washington Bridge and the twinkling lights of Manhattan. It is quite a site and on warm days there are tables outside for diners to take in the million dollar view. Dolphin is a family owned business and I learned that the father of the family originally owned a restaurant in Manhattan with the same name. I would categorize the food as traditional classic with an emphasis on seafood which is perfect considering its waterfront location. There are menu options including steak, chicken and pasta outside of the numerous seafood offerings. There is also a wonderful metro chic bar with fun and interesting drink choices . This casual fine dining spot could not have been a better choice for a dinner out with friends on a lovely warm Autumn evening. We all admired the cool, fun atmosphere and the modern edge of the interior decor of Dolphin. The large round windows reminded me of being on a ship. We began our meal with a round of appetizers. The large portion of baked clams were perfectly seasoned with garlic herbs and breadcrumbs. We all enjoyed this tasty start to our meal. 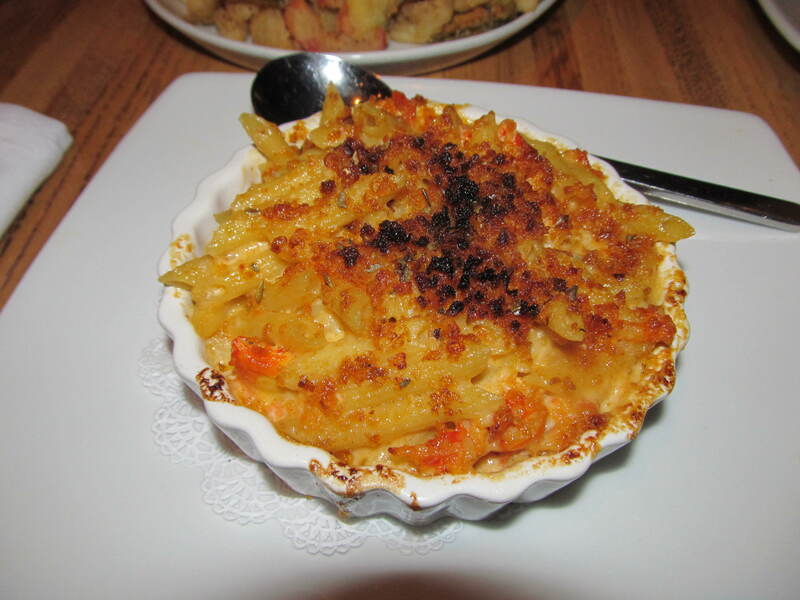 A wonderful and not to be missed dish is the Lobster Mac and Cheese with three cheeses, creamy lobster béchamel and large chunks of fresh lobster meat. We also shared fried calamari served with a smoked tomato dipping sauce . 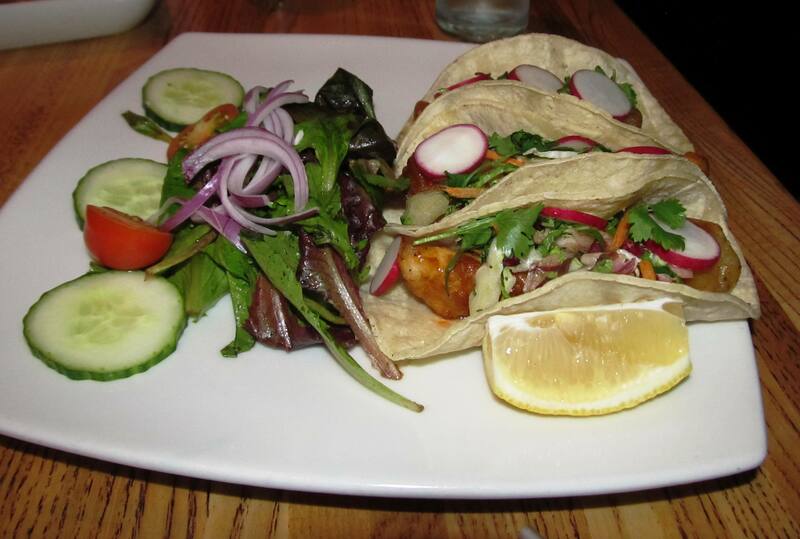 We also shared the Fish Tacos which were fantastic with a topping of house cole slaw. For my entree I ordered the Shrimp stuffed Crab. 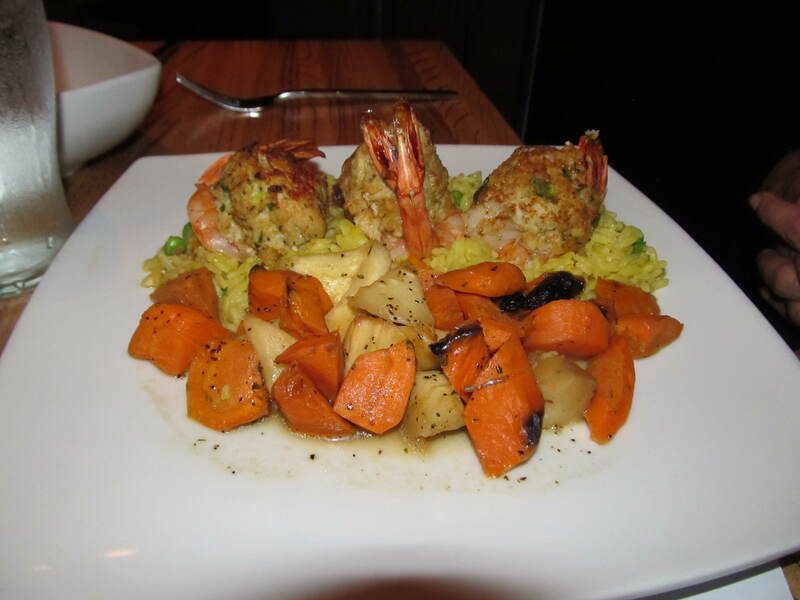 The dish was so tasty with lump crab and shrimp oven baked over saffron rice . I really loved this dish. I also enjoyed a side of roasted root vegetables which complemented my main dish. 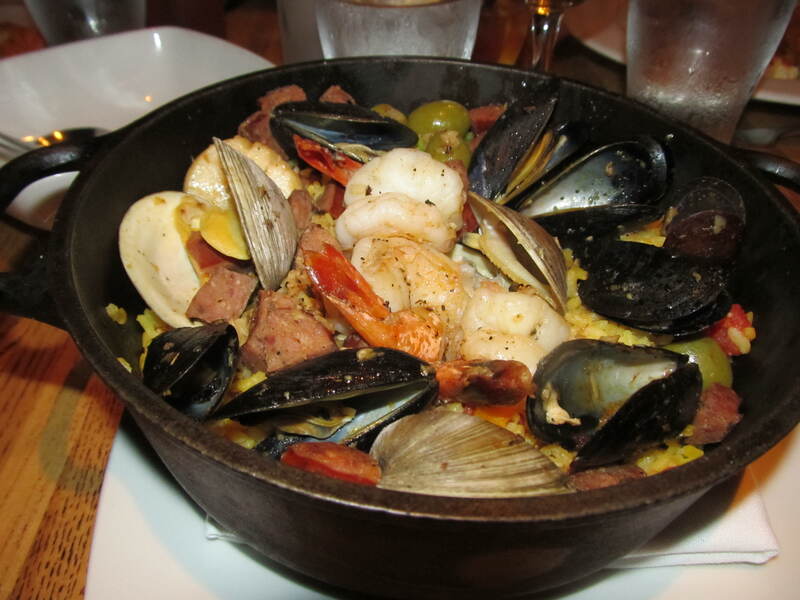 Another dish enjoyed at our table was the paella with mussels, clams and jumbo shrimp, chorizo, saffron rice, peas and olives in a tomato comfit. I was told this was an amazing entree. My other friend picked the Argentinean skirt steak with fries served in a chimachurra pesto sauce. The last entree at our table was Shrimp with grits. The Shrimp as sautéed in a spicy Louisiana entoufee sauce with creamy parmesean grits. This was a unique dish that combined classic ingredients to create a wonderful taste. After this filling and wonderful meal we saved a little room for dessert. 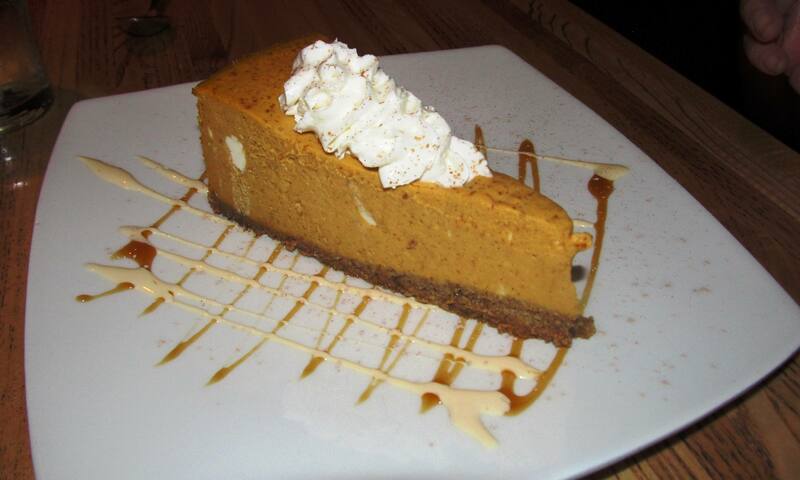 A sweet bourbon bread pudding and pumpkin cheesecake were ordered and both were fresh and made for an excellent conclusion to our meal. 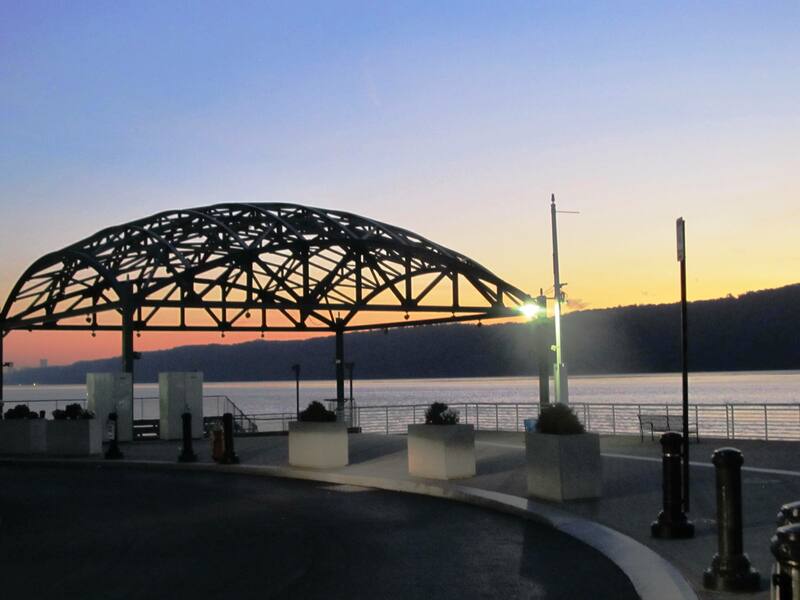 I found Dolphin to be a great place to dine with classic dishes, great service and located on a fantastic spot overlooking the Hudson River and the Palisades. Please do your self a favor and put Dolphin on your list of restaurants to try. L’article donne absolument envie. L’article est en plus très bien écrit. Bravo!